Freelance Society Co-Founder Dylan Roberts has been producing VR content since 2015. His clients for VR (and flatties) range from Ryot and The Economist to The New York Times, among others. The Imagejunkies podcast is now a reality. 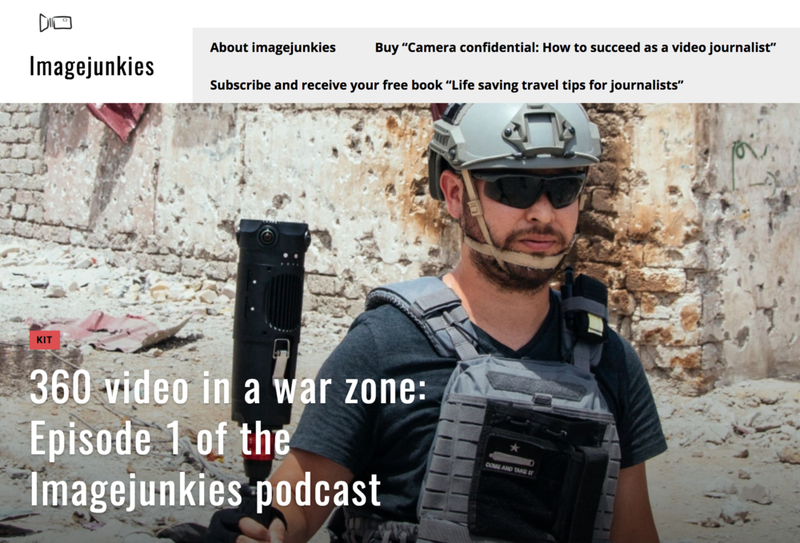 In the first episode, I talk with Freelance filmmaker Dylan Roberts about his work shooting 360 videos in Mosul while embedded with the Iraqi Federal Police. We discuss the challenges of working in Iraq, the kit he uses and his plans for the future. If you are a filmmaker who wants to expand into 360 video or virtual reality filmmaking then you really need to listen to this show. I’m hoping to release a new episode of the podcast every week – on Mondays. We’ll be speaking with video journalists, camera operators, picture editors and security experts about the trials and tribulations of working in TV news and documentary production. Dylan Roberts, Stephen’s business and creative partner at Freelance Society, stood in front of me, smiling. A Texan by birthright, Roberts recently moved to Tulsa and will be at the Tulsa Overground Film & Music Festival to show off the virtual reality (VR) technology behind his reporting techniques and give insight to the possibilities VR brings to the storytelling world. If journalism’s business model is so broken that it can’t find a way to get Christian Stephen to work then I really think we have a problem. CBS "A virtual look at reality for kids in quake-ravaged Nepal"
LONDON-- To appreciate the scale of the emergency still facing Nepal's children a year after an earthquake shook the country to its core, you have to see it and hear it -- you have to feel it.